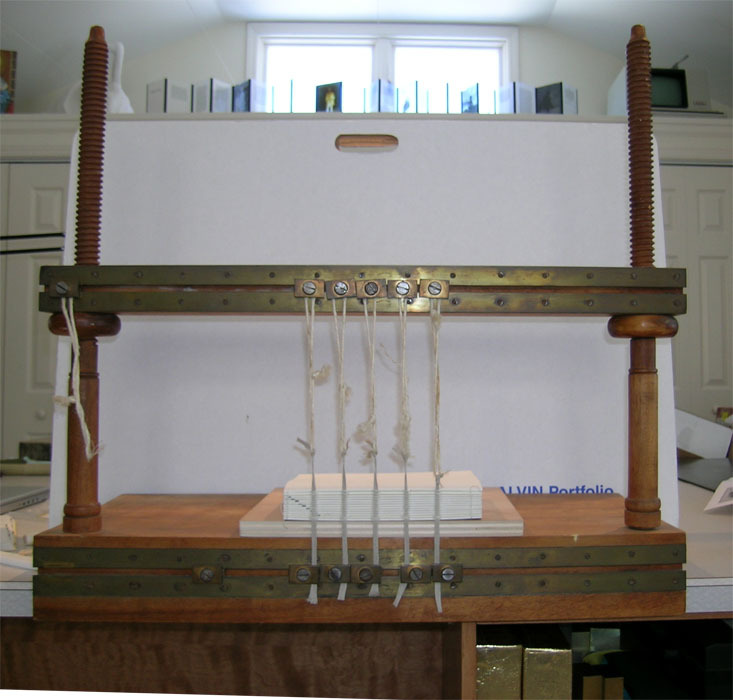 Earlier this year I wrote a post about the Hickock Blank Book Sewing Frame. I finally got to see one in person this past weekend, thanks to Karen Hanmer, bookbinder and book artist, who brought it to the Historic Cloth Case Class I was teaching at Columbia College, in Chicago last week. 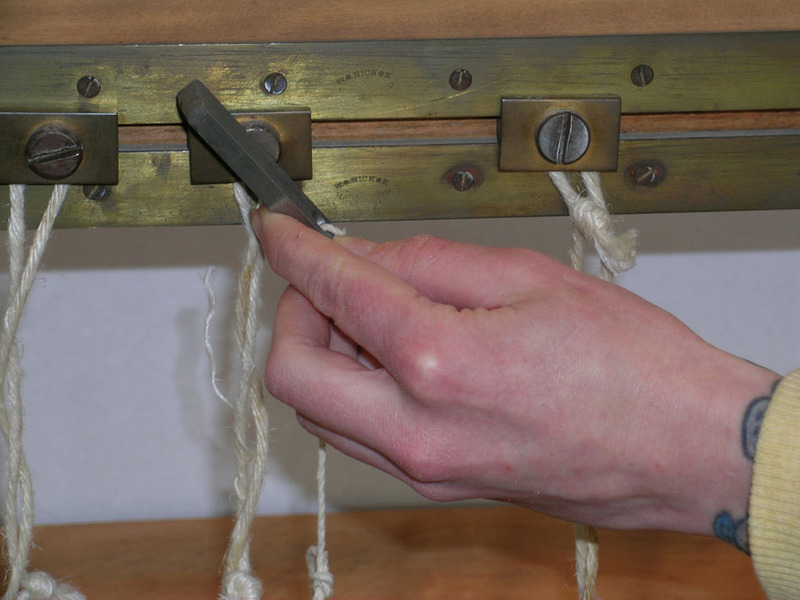 It is a very cool sewing frame, beautifully made, and works for all types of sewing supports: cords, tapes or thongs. The brass t-slots are stamped with the a Hickock logo in the middle (barely visible in this image) and I think the brass is the same thickness and size as the large pressboards that they also manufactured. A small screwdriver type tool tightens or loosens the buttons. She mentioned that the only drawback is that because of the size of the buttons, supports cannot be spaced too closely together. I suspect that the only reason the top bar is adjustable is that the uprights were a standard Hickock product. 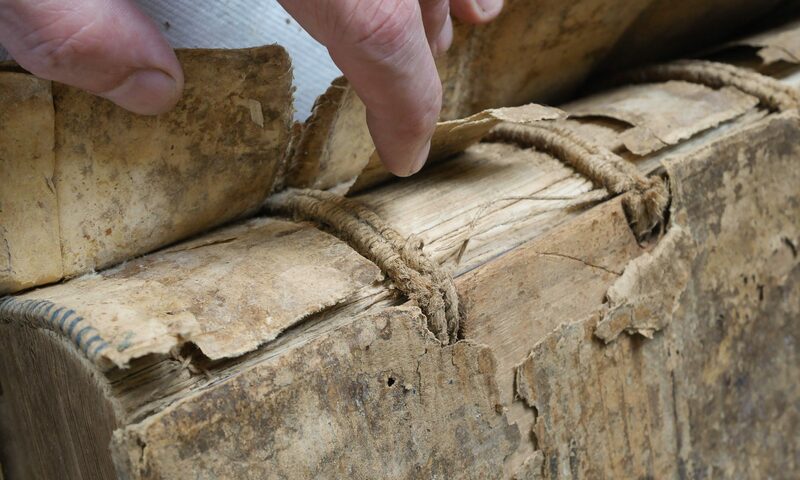 Also the front keeps the frame from sliding around, although the lighter colored wood in the bottom picture appears to be either a replacement or later addition. Because the supports are at the front of the frame, it is much easier to start sewing, or sew in the round. The buttons make tensioning the supports a breeze, with no complex knots or keys to deal with. In the 1920’s, this frame cost $15.00, verses $4.50 for a standard frame about the same size, which may be why it didn’t became more popular. I was so impressed by the frame, that I have started experimenting making a modern version, out of aluminum, with closer spacing for the supports, and with a little luck I should have a prototype by the end of the summer. 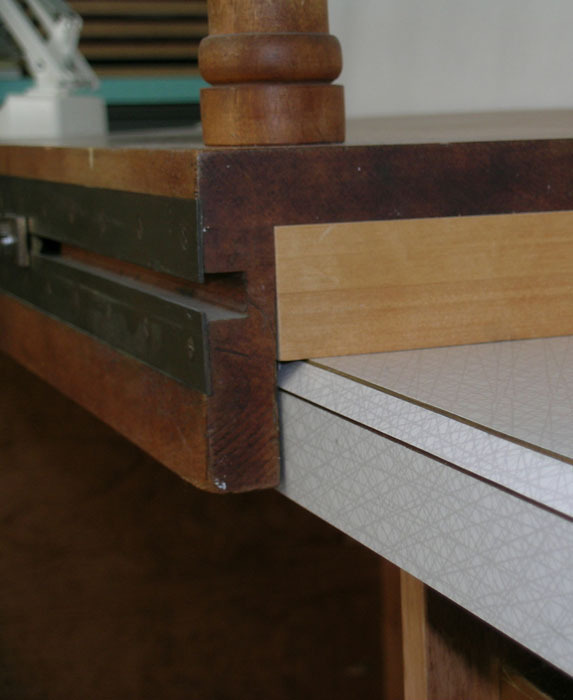 I plan to make the uprights on a hinge, so that the frame, when collapsed, will be less than two inches in thickness for easy, dust-free storage. Images courtesy of Karen Hanmer. The key is very interesting to me. Both of my frames that are nearly identical to Karen’s are missing the original key. I just use a wide flathead screwdriver. How would you describe Karen’s ‘key’ and did it appear to be original to the frame? Thanks for the pictures! The key seemed old, but I have no way of knowing for sure. It is about 2 inches long, 1 inch wide, with a thin tongue that fits into the screws. I suppose, if making a reproduction, I’d make one out of brass to avoid scratching the original screws. Shouldn’t be too tough to make, even with just a hacksaw and some files. Thank Karen for the photos, not me! In that case, thanks for the photos Karen! Jeff, if you do, in fact, make a reproduction knock out an extra key for me as I’d love to have one to go with our frames.